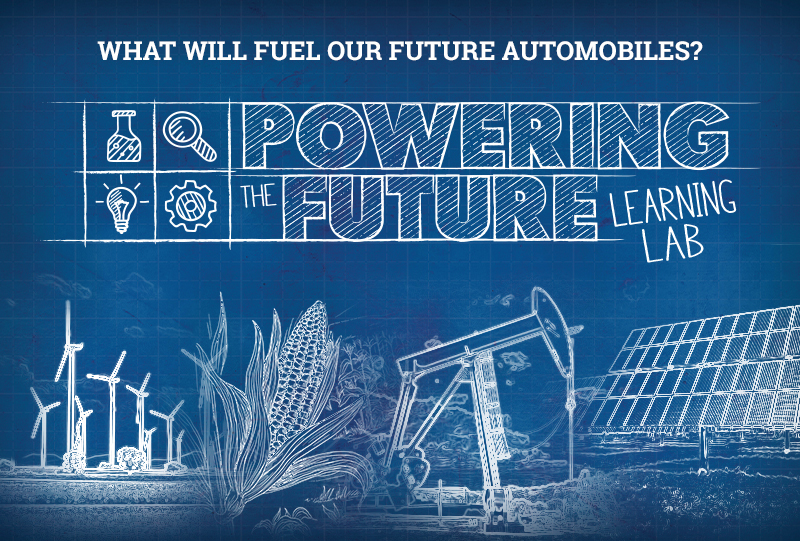 Step into Powering the Future to consider what will fuel future vehicle needs! In this new, hands-on Learning Lab, inquiry-based exploration highlights innovative thinking and engages visitors and students around some of the most important questions of our time: What will power the future? How can we meet our current and future energy needs for transportation in a sustainable way? How do we make choices to meet our needs without compromising the needs of future generations? Arriving at the beginning of the exhibition space, visitors will first enter into Powering the Past where large graphics of the first automotive advertisements and examples of early “horseless carriages” will remind visitors of the myriad ways inventors of the time chose to power vehicles. We hope this space will put our visitors in the shoes of people in the early 1900s as they find answers to the questions: Why were vehicles an important invention of the time? How were these vehicles powered? How were these vehicles different from the cars we drive today? 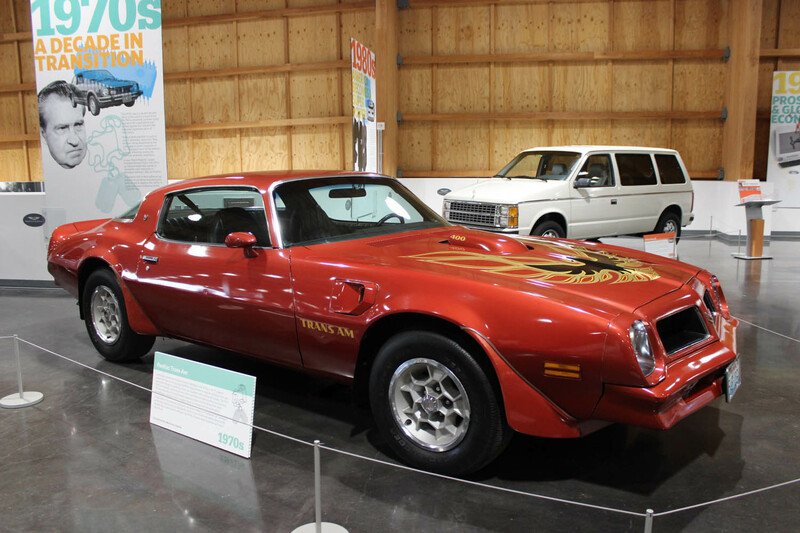 When we launched the Through the Lens – Cars Defined by an American Century exhibit in December, we put forward ten automobiles, one from each decade 1910 – 2010, that we argue best represented the history and culture of the period. The idea was to ”make the case” for the specific cars while leaving it up to visitors to decide on their own. 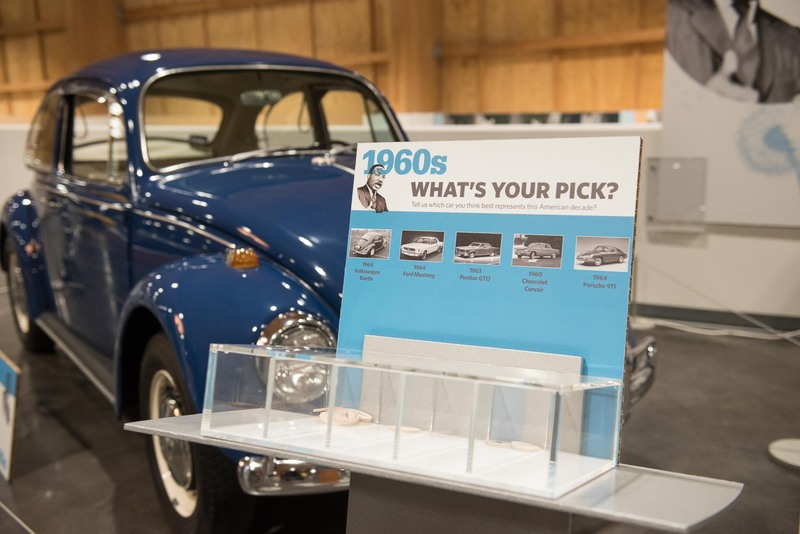 To have some fun and encourage dialog in the exhibit, we created a feedback component where guests cast votes for one car per post-war decade, with a promise to change the exhibit based on their opinion. And vote they have. Without influence from foreign powers, 45,000 votes have already been cast. The Vox Populi have spoken, and we are making changes, the first being for the 1970’s. 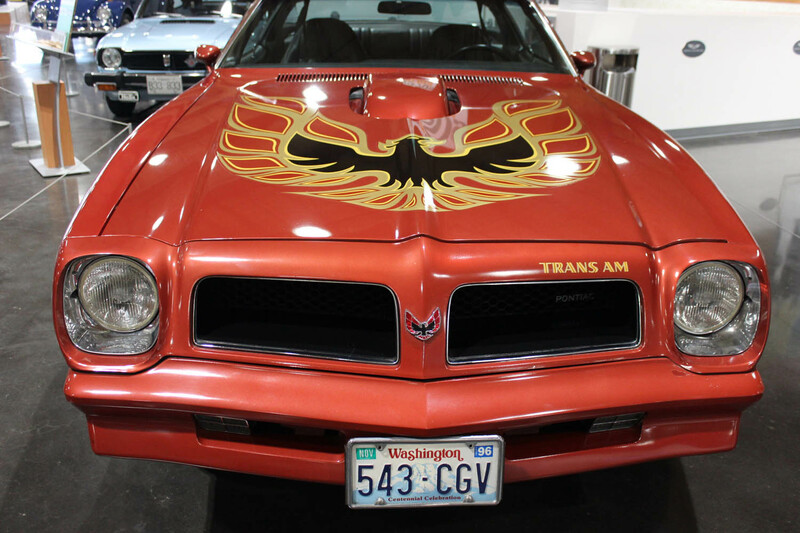 Of the five cars from that decade, the Trans-Am has handily beaten the others. Accordingly, we added an epic Screaming Chicken adorned 1976 example to pair next with the first generation Honda Civic. Suffice it to say; you’ll not likely see two cars contrasting each other as much as these. In another part of the exhibit, visitors have a chance to record which car brand will define the decade ending in 2020. The hands-down choice is the Tesla, with over 75% of the comments. Voilà, we added a pristine first generation to the exhibit. 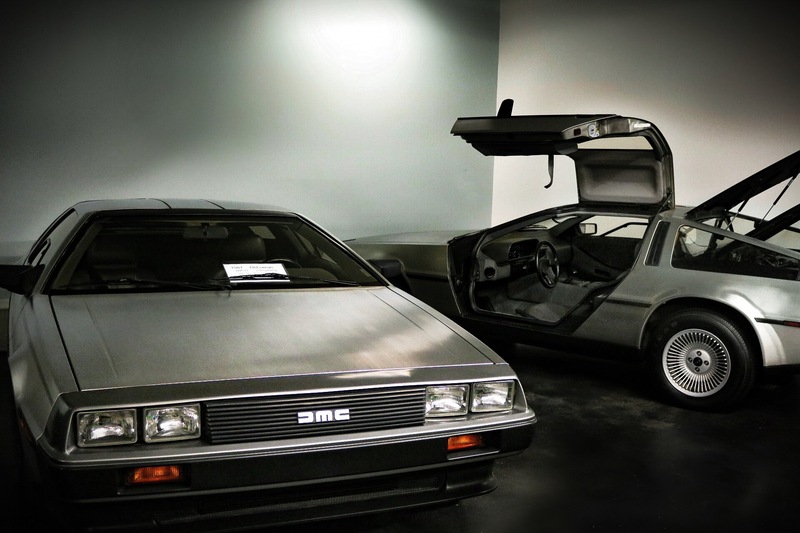 Another clear favorite has been the DeLorean for the 1980’s. We decided not to add that to the exhibit because we have two excellent examples, side by side, on the next floor down and are reluctant to separate them. The top vote gatherers aren’t the only things changing. A few on the list have been, well let’s just say, unenthusiastically received. Cars like the 60’s Corvair, the poor Pinto from the 70’s and 80’s Dodge Aries K-car aren’t generating a lot of love. Therefore we decided to shake-up the voting and replace these too. What should we add to the list? A month and a few days ago we launched a new exhibit named Through the Lens – Cars Defined by an American Century. The premise of the display is based on the notion that automobiles are an excellent “lens” to view American history and culture. This idea inspired an exhibit that explores which cars best reflect American history and culture of the time. Lewis Carroll’s, Through the Looking-Glass, Alice and What Alice Found There, again lands Alice in a fantasy world, this time by climbing through a mirror into the world seen beyond its reflection. 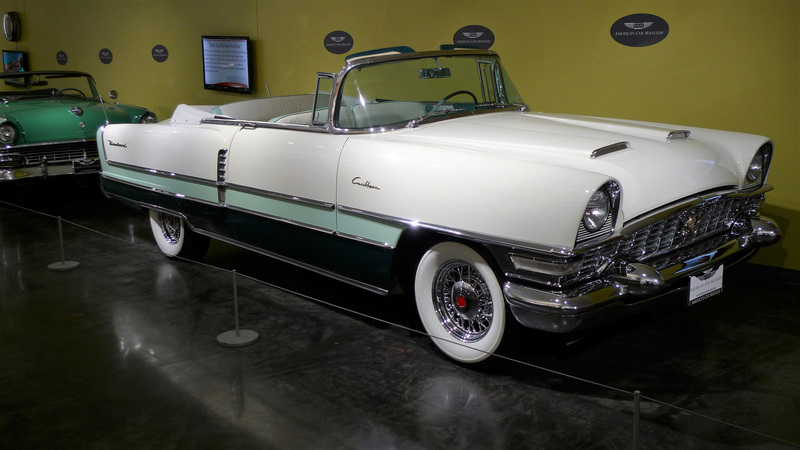 Instead of a fantasy world, America’s Car Museum’s new exhibit, Through the Lens – Cars that Defined an American Century, is a snapshot of something more tangible, the history and culture of America dating back to 1910. 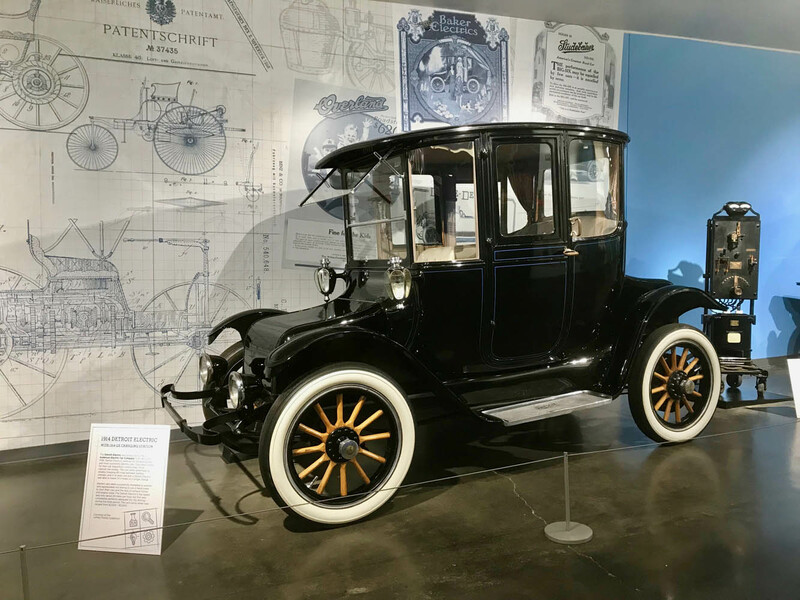 We created the exhibit on the premise that American history and the automobile are inextricably intertwined making cars are the perfect lens to entertain and educate. In this case, the newest exhibit, Through the Lens, focused on a century of American history and culture as told through automobiles and period iconography. As an example, what car do you believe best reflects the, er, Go-Go 1960’s. 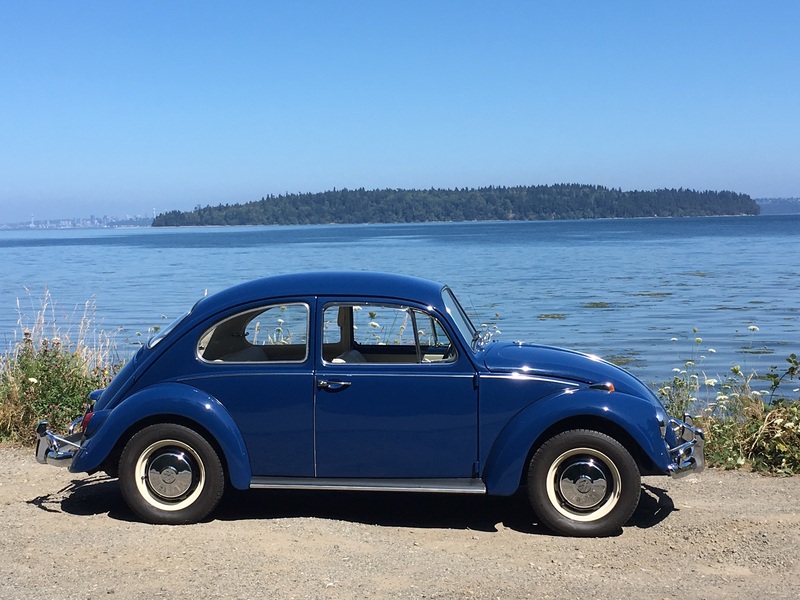 Was it the unlikely VW Beetle? Or was it the cultural phenomenon Mustang, or John Z’s GTO? All are different, and all reflect their era. The mechanism to tell the “Cars that Defined an American Century” story will be a selection of ten vehicles, 1910-2010, set in front of individual decade backdrops with period iconography and copy that positions that period in the context of the culture of the time. A correlation between milestones in technical innovation, design, labor, commerce, mobility, and entertainment, as reflected in specifically featured automobiles, will be made. 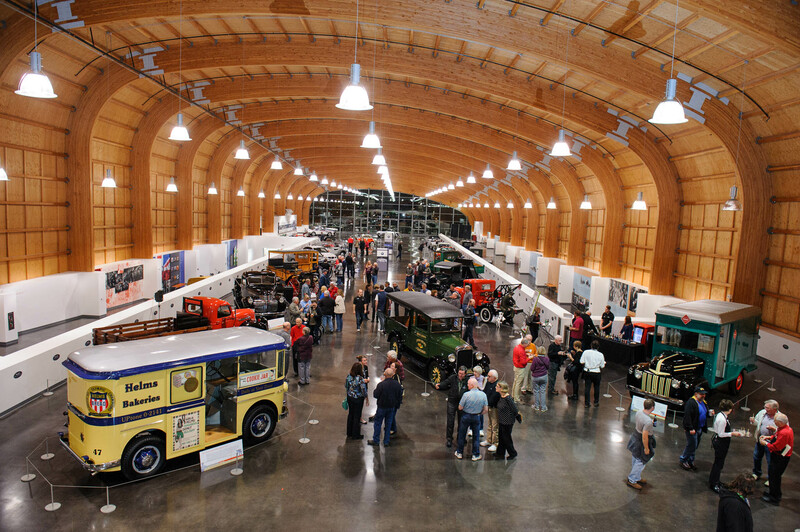 While ACM will “make the case” for a single car for each decade, visitors will get a chance to voice their opinion by voting from a list of thirty postwar automobiles. And, at the end, make their thoughts known by listing the car that will define the decade we live in today. What car will define 2010-2020? It’s your chance to decide. Come visit and join the conversation. It’s going to be very interesting. 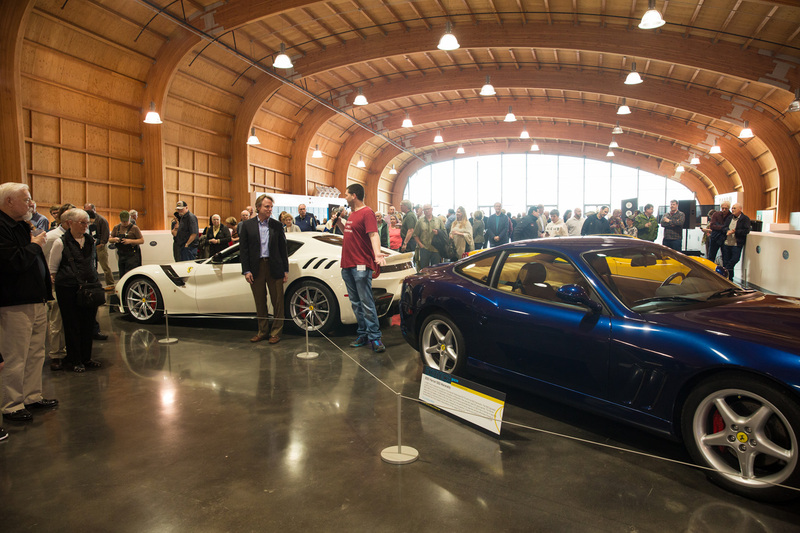 ACM Curator Scot Keller (left) introduces the cars with their owners at the Exclusive Member Preview of Exotics@ACM – Seductive Supercars. ACM’s newest exhibit, “Tools of the Trade – Powering the Working Class” tells the story of the steadfast work vehicles that formed the backbone of American commerce in the first half of the 20th century. One of the questions asked most by museum guests, the media and friends are “What’s the most (fill in the blank) expensive, rare or historically significant car in the Museum?” That’s one of my favorite questions because it gives us the opportunity to explain our philosophy when curating exhibits at America’s Car Museum. An easy answer would, of course, be our stunning, century-old, 1917 Crane Simplex once owned by John D. Rockefeller, our brilliant 1930 Duesenberg Model J, a visitor favorite, or maybe our 1983 Mercury Grand Marquis station wagon. Always Something New at ACM! You know how sometimes when you pay a return visit to a museum it’s like, “been there, seen that?” Well that’s never the case at America’s Car Museum. From its opening on June 3, 2012, the Museum has taken innovative steps to avoid being a ‘one and done’ destination by continually refreshing the visitor experience… all year round. A program of rotating exhibits is first and foremost in ACM’s strategy of keeping things fresh. If you were one of the several hundred thousand people to visit the Museum during the grand opening year, you would have enjoyed reliving the golden age of British sports cars as part of the “British Invasion” exhibit. Drop in again and you’ll see a whole new batch of cars under that same, yet ‘refreshed’ Union Jack. 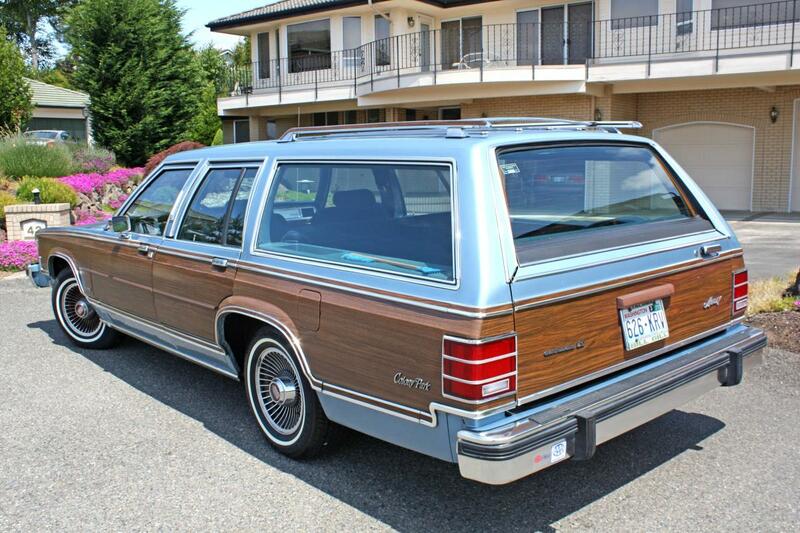 Say you saw “Route 66: Dream of the Mother Road”—see it again for the addition of some great vintage era station wagons. Even the cars Harold LeMay collected are routinely rotated to demonstrate just how rich and varied his collection truly is. 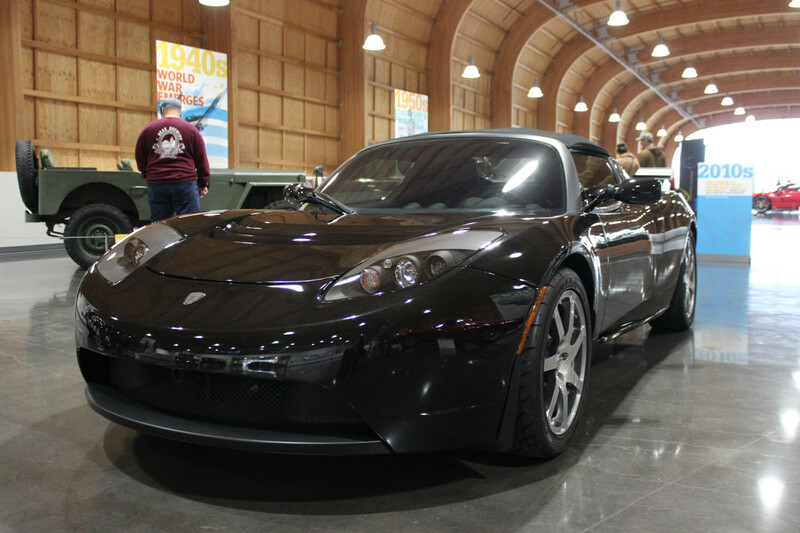 In the three short years America’s Car Museum has been welcoming visitors the Museum’s many exhibit galleries have showcased everything from Ferraris, Corvettes, Mustangs and VW Beetles to custom coachwork classics and alternative propulsion vehicles. 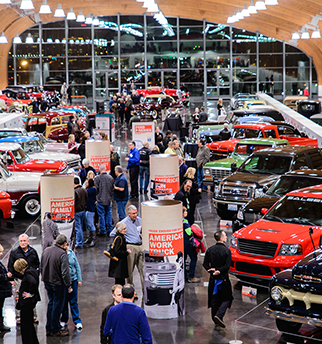 ACM has celebrated the prized cars of Master Collectors, the heroes and bad boys of NASCAR and the “Truck that Grew up with America”… the Ford F-Series. July 10 will see the Museum bulk up big time as “American Muscle Rivals to the End” rumbles on to the main stage… ACM’s Showcase Gallery. These are the cars that, more than any other, defined the U.S. automotive scene in the 60s and early 70s. If all this isn’t sufficient cause to keep you coming back, we haven’t even mentioned the Museum’s calendar of events that feature vintage motorcycles, concours class automobiles, drive-in movies and cruise-ins. Even the stock in the ACM Store constantly contains new and exciting gifts, books and items of clothing. Oh yes, and then there are all those educational programs for youngsters, adults and families. The point is, no matter how many times you visit America’s Car Museum, you’re in for a “fresh” adventure.